In March 2011, MAA traveled to China to meet with children at several different orphanages who were waiting for families. The staff of MAA makes these trips to China 2-3 times per year to meet children who desire to have a family of their own. On this particular trip, they met a little girl who touched their hearts. They decided to call her Margaret. Margaret was only 4 years old. 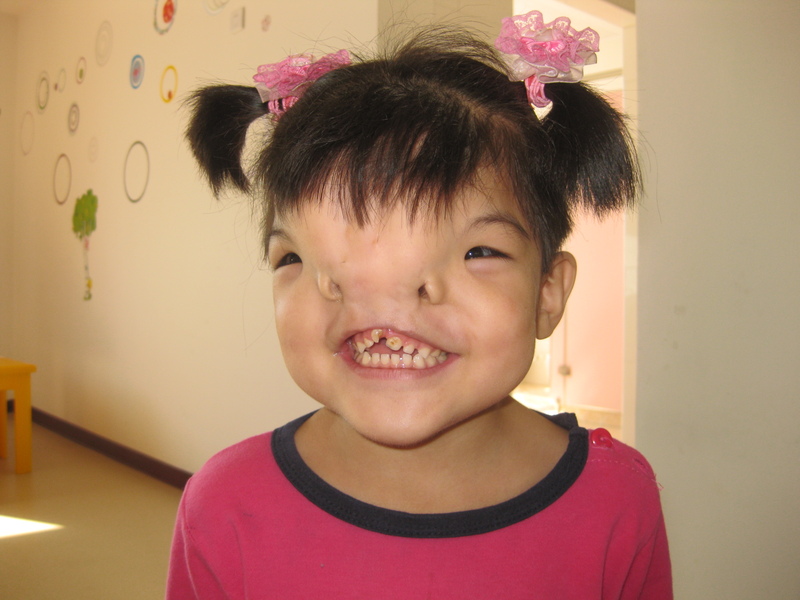 She was born with a severe cleft in her skull that caused a facial deformity. While her appearance may have caused some initial uneasiness, her bright spirit quickly won over the hearts of everyone who met her. MAA returned home determined to help this girl find a family and to get the corrective surgery she needed. MAA applied to Mending Kids International in the hopes of providing a way for Margaret to receive surgery. MAA spoke to families who have adopted children with the same medical condition as Margaret. The agency found several families who were willing to host Margaret if she was able to come to the United States for medical care. After more than a year of advocating, MAA received confirmation from Mending Kids International that surgery would be provided for Margaret. Although MAA thought that Margaret would travel to the USA to receive surgery, it was determined that her surgery would take place in Shanghai. The World Craniofacial Foundation provided two world-renowned surgeons who donated their expertise to help repair Margaret’s facial anomaly and hopefully make her more adoptable. Craniofacial surgeon, Dr. Kenneth E. Salyer from Dallas, Texas and Dr. Derek Bruce, a neurosurgeon from Washington, DC studied the medical information of Margaret and came up with a plan to provide the surgery she needed. They traveled to Shanghai in November to meet Margaret and perform the preliminary testing needed. X-rays and MRIs were sent to Medical Modeling Inc. in Colorado. Drs. Salyer and Bruce relied on the modeling of Margaret’s skull to help them prepare for the 10 hour surgery. They were assisted by a Chinese plastic surgeon who is based at the Shanghai hospital. The cost of Margaret’s surgery was approximately $30,000. Margaret’s positive outlook and joyful spirit no doubt helped with her recovery. She continued to heal while living with a foster family back in her home town of Harbin, China. MAA was hopeful that any additional surgeries could take place after she was adopted by a forever family in the United States. According to Margaret’s referral report, she was found on September 1, 2007 at a train station, apparently abandoned due to her facial deformity. All reports indicate that Margaret’s physical, intellectual, and emotional development are all normal. She is attached to her caretakers and is described as a lovely, sweet, polite, independent, and curious child. Margaret is also said to be intelligent and verbal and to have a good vocabulary. She reportedly is expressive and enjoys singing and dancing. Margaret’s story could not be told without the work of The World Craniofacial Foundation, Mending Kids International, and Madison Adoption Associates. We all look forward to the next chapter in Margaret’s story her adoption and having a family who will love her unconditionally and provide her with the bright future she deserves. Note: Margaret’s referral file was transferred to another agency after MAA spoke to a family who was committed to her adoption and future medical care. Margaret is now home and enjoying her new life with a forever family!